I’m a fan of leadership — of people who have a clear vision and stick to it. I’m not sure the people behind Al Gore’s ineffective movie, “An Inconvenient Truth,” (and yes in my book I called the movie, ‘The best-made and most important piece of environmental media ever,’ but let’s not forgot that the Titanic and the Hindenburg were well-made and important) had this attribute. They made a movie that said basically “this is the most important problem facing humanity,” but then immediately went on to other projects. If their issue was so almighty important, why didn’t they stick with it? 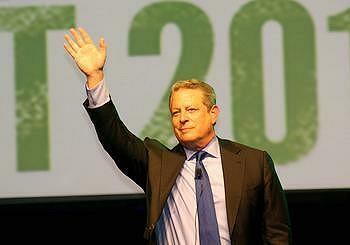 But Al Gore has stuck with it. He followed the movie with a bunch of different efforts of varying degrees of success; the most important thing is that he has remained true to his mission. And that’s the sort of tenacity that eventually pays off. That was his first public exercise in learning behavior. The second has been his attitude towards climate skeptics. With “Inconvenient Truth,” he tried to sweep the entire skeptics movement aside in a single moment by pointing out that none of the major scientific studies of Anthropogenic Global Warming (AGW = Angry Gray-haired White males, according to one friend of mine) concluded that humans were innocent. Which was a terrible gesture — to try and simply ignore a movement that was already spending hundreds of millions of dollars to prevent climate legislation. It’s been 5 years since then. Gore has been forced to witness the stunning effectiveness of the Climategate attack on climate science coupled with the complete success of the skeptics in preventing the passage of climate legislation. And further compounded by the horrific wastage of money (over a third of a billion dollars at least) by the environmental movement trying to get Cap and Trade passed. He’s finally at the point where he’s willing to let go of the “ignore them and they’ll go away” strategy. Notice he has changed the name of his large communications project from The Alliance for Climate Protection (which says little) to The Climate Reality Project. He’s not the greatest communicator that ever lived. He’s no Ronald Reagan. But he has tenacity. And he is the best hope for the environmental movement.